The programme encourages all schools to evaluate their current provision of P.E. and extracurricular sports activities for the children and increases parents' awareness of facilities, teams and clubs in our area. This is a non-competitive initiative highlighting the importance of physical activity in and sport in schools and communities in which they are based. Our school decided in September 2014 that we would try for the Active School Flag this year. In fact, we began our journey almost 5 years ago! We have been improving all areas of P.E gradually and feel that this year, we are in the final process. At our staff meeting in October 2014, the P.E. coordinator gave a presentation on the Active School Flag. We know that there is still a lot of hard work to be done, but we are up for the challenge. Our first task was to set up an Active School Committee of Teachers. We are very excited about all the new activities and initiatives that will be coming on stream over the coming weeks and months. We aim to seek assistance from our local sports Partnerships such as Fingallians G.A.A. club and Fingal Sports initiative and the Irish Heart Foundation. We have arranged for Eoin Mc Grath from Fingal Sports Initiative to give a Teachers Workshop on 'Sports Conditioning' next February. This professional development for our teachers will help to support them to develop their P.E. programmes and promote physical activity within the school. 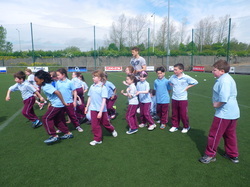 St. Cronan's Junior School promotes an active, healthy lifestyle for our children. Here are some of our initiatives. 1. We are linked closely with Fingalllians G.A.A club and Gaelic Games are given particular consideration as part of the Games Programme. We aim to give Senior Infants, First Class and Second Class 6-8 weeks of coaching each year. 2. If a local team or individual has had a notable victory , they will be invited into the school to share the victory with the children. 3. We have a Games Club in the school which takes place afer school hours which is very popular with our First and Second Classes. 4. 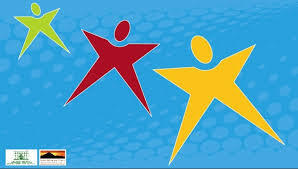 Active Week takes place each year, which involves 'shake and wake', 'walking bus', fund raising event, extra p.e classes.